Writing about Neil Gaiman's recent novel The Ocean at the End of the Lane a few weeks ago, Guardian reviewer Edward Docx expressed the wish that the novel could have been stripped of its fantastic elements and left with what, to him, were its stronger mimetic elements: "Gaiman's intelligence and his skill as a writer—to this reviewer at least—are best mobilised in the adult writing he purports to eschew; his account of real human drama, relationships, sensibility, emotions, thought." This caused some flurry of consternation on Twitter (not least, of course, because of Docx's history as a provocateur of the genre wars), but to my mind Docx's review, however inflammatory, raises a valid point of discussion. A great deal of fantastic writing uses its non-realist elements as metaphors for the thoroughly mundane, or as a gloss on it. It seems only fair to question that choice. What, if anything, is gained by having the narrator of Gaiman's quasi-autobiographical novel square off against monstrous creatures from outside of our reality, rather than the horrors and wonders of a troubled childhood? What is lost? I found myself asking the same questions during my reading of Helene Wecker's debut The Golem and the Jinni , a novel that simultaneously justifies its existence by overlaying a familiar reality with the fantastic, and is undermined by its reliance on those fantastic elements. 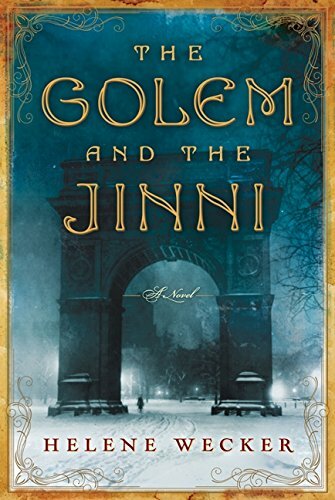 Set in the immigrant neighborhoods of New York City at the turn of the twentieth century, The Golem and the Jinni begins with the activation of the titular Golem aboard a ship headed from the Old World to the New. Almost as soon as he's brought it to life, the Golem's master dies of a burst appendix, leaving his servant burdened not only by its inhuman (and thus dangerous, to itself and to others) nature, but by an awareness of the wants and desires of all the people around it, and a craving to satisfy them. In an additional twist, this Golem is a woman, purchased by her master from the unscrupulous Kabbalist Yehudah Schaalman to be his wife. Wecker's handling of Jewish tradition and mysticism is shallow: while joking about the Golem's high price, Schaalman quips that "'isn't it written that a virtuous woman is more precious than rubies? And her virtue'—he grinned—'will be guaranteed!'" (p. 3). Though the King James Bible does translate Proverbs 31:10 as "Who can find a virtuous woman? for her price is far above rubies," the original phrase, Eshet Chayil, is more correctly translated as "a woman of valor" or "a woman of works," and the rest of the chapter is concerned with the accomplishments of such a woman. For a learned Jew, as Schaalman is later revealed to be, to represent Eshet Chayil as referring strictly to virginity is highly implausible, especially as he is speaking Yiddish, not English, in this scene. In other places, Wecker seems to have picked and chosen those elements of the story of the Golem that suit her, and combined them with elements of bog-standard fantasy—the Golem's activation and destruction, for example, as well as other feats of Kabbalistic magic, are achieved through speaking what are effectively magic spells, thus erasing the all-important role of the written word in Jewish mysticism. Nevertheless, Wecker's choice to recast the Golem from a figure usually associated, even in the fantastic genres, with the masculinist qualities of protection and defense (for example in Marge Piercy's excellent He, She, and It ) into a kind of Yiddish Galatea is an intriguing one. It opens up new avenues of discussion for this well-trod fantasy element, for example the ways that the Golem's female form restricts her choices and freedoms in a manner that a male Golem would never have experienced. Wandering the neighborhoods of New York, the Golem is recognized for what it is by the retired Rabbi Avram Meyer. He takes her under his wing, names her Chava, and tries to help her integrate into human society while worrying about the inevitability of his super-strong charge running amok and having to be destroyed. Frustrated by the seeming purposelessness of her life following her master's death, Chava is further exasperated by the restrictions Meyer places on her in order to allow her to pass as a "respectable" woman—though sleepless, for example, she is forbidden from going out at night on her own. When she discovers an affinity for mindless, repetitive labor, Chava's female form implicitly directs her towards traditionally feminine pursuits—she cleans Meyer's apartment, gets a job at a bakery, and takes in piecework from her neighbors—a point that Wecker seems initially willing to gloss over until she has Meyer muse that "Certainly she needs physical activity. If only women could be bricklayers, stevedores . . ." (p. 370). And, of course, Chava's affliction, the unexpected consequence of her master's death which leaves her aware of and vulnerable to the wishes of everyone around her, ties into the perception of women as caretakers and helpmeets, and her (and the narrative's) ambivalence about this power reflect on that perception. Around the same time, Boutrous Arbeely, a young tinsmith in New York's Syrian-Christian enclaves, sets to work on a seemingly trivial assignment, a repair of a battered old oil flask, and unleashes a Jinni trapped within it for hundreds of years (" But how did you fit in there with the olive oil? " [p. 27], Arbeely wonders, in one of the few moments of wit in a novel whose dominant tone is otherwise a sense of melancholy). Transformed into a human and held in that form with an iron bracelet, the Jinni has no memory of how he ended up in the flask, except his belief that a wizard trapped him in it. He is not, however, the wish-granting Jinni with which we (and Arbeely) are familiar. Wecker imagines an entire ecosystem of desert-dwelling jinn, who rarely interact with humanity (and then usually to cause mischief) and whose only weakness is water (since I've mentioned the liberties Wecker takes with Jewish tradition in this book, it's only fair to acknowledge that she may have done the same with the Syrian history and Arab folklore that make up the Jinni's background, but that I am not in a position to judge this). Arbeely names the Jinni Ahmad and tries to integrate him into the community of Little Syria by presenting him as his new apprentice. Though in most respects the Jinni appears to be human, he is still capable of producing fire, which makes him a natural metalsmith, and when he reveals an artistic talent Arbeely expands his business to produce jewelry and decorative metalwork. But like Chava, the Jinni is frustrated—by the loss of his home and community, by the missing knowledge of how he was captured and why, by the dangerously damp city in which he is trapped, and the endless ocean surrounding it. Unhindered by Chava's female form, and despite Arbeely's protests that in doing so he could bring unwanted attention and even danger to the Syrian community, Ahmad takes to wandering the streets at night, exploring New York's seedy neighborhoods and its spacious parks, and carelessly pursuing his pleasures—most notably, seducing the debutante heiress Sophia Winston. As this description suggests, there is a schematic quality to The Golem and the Jinni 's early chapters. Ahmad's age and experience (at the time of his incarceration he was already several hundred years old), his matter-of-fact, even supercilious, understanding of his nature and history, stand in stark contrast to Chava's newness, as an individual and as a lifeform. His arrogant carelessness and lack of consideration for others oppose her sober caution and willingness to be ruled by Rabbi Meyer. His chosen maleness (in flashes to Ahmad's past before being trapped in the flask we see him taking human form as a man to seduce human women) is placed against her imposed femaleness. Even their mentors—old, wise Rabbi Meyer versus young, inexperienced Arbeely—feel like mirror images. That, combined with the way that Wecker alternates the novel's early chapters between Chava and Ahmad's stories but describes essentially the same experiences for each character—arriving in New York, being adopted by a human, finding a job and a human cover—gives the novel a certain clockwork feeling. Wecker combats this impression, firstly, by making Chava and Ahmad's paralleling storylines merely the trunk of a proliferating tree of stories. She delves into the history of not only Rabbi Meyer and Boutrous Arbeely, but Meyer's nephew Michael Levy, a socialist who runs a hostel for newly arrived Jewish immigrants and is estranged from his uncle over his break with religion; the Syrian ice cream salesman Mahmoud Saleh, whose history of tragedy is, unbeknownst to him, bound up in creatures, like the Jinni, in whom he doesn't believe; Anna Blumberg, Chava's colleague at the bakery who came to New York for a life of adventure but finds herself pregnant and jilted; Sophia Winston, whose dalliance with Ahmad has unintended, tragic consequences; and Schaalman, whose spotty past eventually reveals a connection with Ahmad as well as Chava. In doing so, Wecker leads the reader to expect a plot-oriented, almost pulpy work in the vein of Michael Chabon's The Amazing Adventures of Kavalier and Clay (2000), in which the wide-ranging cast of characters, brought together by the bustling city at which they've arrived and the transformative era in which they're living, interact in ways that change all their lives. But the second thing that Wecker does to counteract the predictability of her novel's shape is to avoid this expected development of it. The Golem and the Jinni is a novel of missed connections. Rabbi Meyer and Michael Levy never resolve their differences; Anna's difficult situation resolves itself better than it might have, but consigns her to a mundane, hardscrabble existence as a single mother; Arbeely begins the novel a hardworking but lonely tinsmith, and ends it wondering, " have I been a bachelor too long? Did I miss my chance? " (p. 460), a question which the narrative never answers. Loneliness is, in fact, the dominant emotion of The Golem and the Jinni . The familiar narrative of early twentieth century immigration to the US—as presented, for example, in Kavalier and Clay —treats it as the opening up of the immigrant's world, a transition from a proscribed, often oppressive way of life to one that offers freedom and limitless opportunities, including the chance to meet and interact with new and different kinds of people. But for Chava and Ahmad, New York is as proscribed a world as Europe or the Syrian desert—much more so, in Ahmad's case. Far from the vibrant, bustling city we know from other stories, it is a world of tiny, barren tenement rooms, of empty midnight streets, of immigrants far from anyone or anything they know bedding down in anonymous hostels and working all day and night to send money home, of ethnic neighborhoods bounded by barriers of culture and language (almost none of the Jewish or Syrian characters in the novel speak English). Chava and Ahmad are doubly isolated, unable to look inward and find solace in their community as the humans around them do. Unlike other literary Golems, Chava does not consider herself Jewish, and seems to have no strong feelings about religion or tradition at all, except to accept Rabbi Meyer's strictures to respect them in order not to stand out. Ahmad, meanwhile, finds the entire concept of religion ludicrous. Neither do they take much solace in the social aspects of the Jewish and Syrian communities, which The Golem and the Jinni anyway treats with some ambivalence—as noted, even human characters like Rabbi Meyer, Michael, and Arbeely are unable to find solace for their loneliness in communal living. Ahmad can't understand why he's expected to attend weddings or funerals, since he sees himself first and foremost as an individual, beholden to no one. When his human life, and with it his role in the community, begin to solidify, he reacts as though he's been trapped—"Was this really what he wanted? He'd apprenticed himself to Arbeely out of desperation, the need for shelter in a strange place. And now, to have a stake in the business—that implied responsibility, and permanence" (p. 262). Though the novel highlights the costs of such an attitude for the people Ahmad toys with and then forgets—Sophia Winston, a Bedouin girl whose affair with Ahmad precipitated his capture by the wizard—it also points out how restrictive and isolating communal mores can be. When Rabbi Meyer dies, Chava is prohibited from attending his funeral because she is a woman, and earlier, when she tells him about Anna Blumberg's escapades, he somberly but obliviously explains that Anna "has everything to lose. Marriage has many benefits, and one of them is the protection of a child, the likely result of their . . . .current behavior. An unmarried man is free to leave a woman, whatever condition she may be in, without consequence to himself" (pp. 154-5). It's only when they meet each other that Chava and Ahmad find a way out of their loneliness—or rather, someone to be alone with, with whom they can share their unique nature and feelings of isolation. They explore the city together, and talk about the things they can't say to anyone else. They also argue over their differing perspectives, chiefly Chava's feelings of communal responsibility and her dedication to secrecy, as opposed to Ahmad's heedlessness. But as Ahmad says, despite their different perspectives, "I look forward to walking with you. I think I even look forward to the arguments. You understand what my life is like, even when we disagree. Arbeely tries, but he can't see it the way you can" (p. 279). Slowly, that connection turns to fondness, and then very delicately into a love story. Though well done, the use to which Wecker puts her fantastic elements brings me back to the question with which I opened this review. Unlike Edward Docx, I'm not inherently opposed to the fantastic, nor do I feel that it inevitably undermines "real human drama, relationships, sensibility, emotions, thought." But reading The Golem and the Jinni , I couldn't help but wonder: would the novel had been any worse, or even that different, if the cover stories concocted by its protagonists and their guardians were actually true, if Chava had been a young, naive Jewish widow newly arrived in New York City, and Ahmad a headstrong, self-absorbed Bedouin happy to take his pleasures where he could and not think about what they cost others? What does the novel gain by being fantastic? While reading The Golem and the Jinni , I was reminded of Millen Brand's The Outward Room (1937, reissued by NYRB Classics in 2010), in which a young woman who has run away from a mental institution comes to New York and tries to live an independent life, falling in love with a taciturn factory worker whom she's afraid to marry because of her history of mental illness. Like The Golem and the Jinni , The Outward Room takes place in stifling tenements, and its dominant emotions are isolation and loneliness. Its characters are simultaneously trapped and liberated by the community of young, single workers and immigrants they've joined, and its heroine, like Chava and Ahmad, is isolated from her newfound community by a secret about herself, and spends the novel reaching towards human connection through a tentative romance. But Brand, perhaps because he was writing about an era closer to himself, describes New York's tenements with stark realism where Wecker's descriptions are slathered in nostalgia. Like another recent, softly sentimental novel of the early twentieth century, Erin Morgenstern's The Night Circus (2011), The Golem and the Jinni treats the past like a fantasyland, lingering over worldbuilding details that most modern readers will find quaint and enticing—the ocean passage over the Atlantic, the mechanics of making household goods in a smith's shop, the bustle of a Jewish bakery—in a way that makes that past look foreign and exotic, and undermines the rawness of the emotions of loneliness and isolation that Wecker is trying to evoke. In discussions of genre vs. literary fiction, one often comes across the argument that the fantastic genres don't "need" the subtly drawn characters or well-turned sentences valorized by critics of literary fiction, because their effect is achieved through ideas and worldbuilding. It's a reductive argument, to be sure, but one that is also occasionally borne out, as in the case of the comparison between The Golem and the Jinni and The Outward Room . If The Golem and the Jinni were a mimetic novel, Wecker's sepia-toned descriptions would come off as twee, her surface-level character work as juvenile. Whether it was the subject matter that determined the style or the other way around, The Golem and the Jinni could only have worked as a fantasy novel. This Wecker herself seems to have understood, since the novel's final chapters abandon the moving exploration of Chava and Ahmad's loneliness, and the slow growth of their love for one another, for a conventional fantasy climax. Schaalman emerges as the villain of the piece, and the Golem and the Jinni, as well as some of the human friends and acquaintances they've amassed, must stop him from gaining control of both their powers. On one level, this is a justification for Wecker's choice of genre—you can't have an evil wizard in a mimetic novel. But on the other hand, Schaalman is by far the least interesting aspect of the novel (or, to put it another way, he's much more interesting before he becomes a plot device, when he's simply a dissipated old man who knows that he is damned but is certain that amassing more power, not atonement, is the key to his salvation) and the chapters in which the characters try to fight him are the story's least interesting turn. Instead of justifying the novel's genre—and its flaws as a work of fiction—they reduce it to the kind of plot-driven adventure that Wecker had previously, and so refreshingly, avoided. And while plot-driven adventure certainly has its place, the jarring shift from the melancholy, contemplative growth of Chava and Ahmad's relationship to an epic fantasy showdown only serves to undermine both elements. 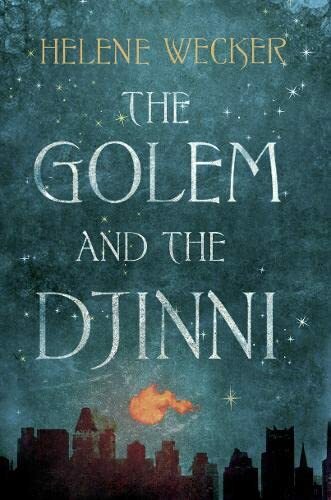 I don't know whether, like Edward Docx, I wish that The Golem and the Jinni had been purely a mimetic novel, but I do think that in relying on genre tropes and conventions to do some of her heavy lifting, Wecker has created a weaker work, one that pales next to other books that do similar things while being more fully committed to their genres. The novel is at its strongest when it focuses on Chava and Ahmad, on their loneliness and their growing bond. It is this—not the fight against Schaalman, nor Wecker's worldbuilding—that is The Golem and the Jinni 's beating heart. Whether couched in fantastic or mimetic terms, I wish that it had been allowed to dominate it. I'm a big fan of the metaphoric uses of fantasy, but I think lots of fantasy readers want to escape into a different world rather than read what is essentially commentary on our own world. Your point about the different requirements of mimetic and world-building novels is spot on. I just finished reading three fantasy novels which were essentially mimetic novels with the main characters defined as fairies and the fairyland stuff tacked on to the ends. All three would have worked better without the fairyland portions, which seemed shallow and undeveloped by comparison to the earlier sections. Maybe we need to define a new subgenre, so folks interested in this can find it and easily discuss its strengths and weaknesses, and those irritated by it can avoid it. It sounds like this book has some serious problems and that perhaps the fantastical elements were a way for the author to avoid fixing them. The fact that the author does not seem to understand the Jewish traditions that she incorporates into the book is a problem for me. This is a great review. Thank you. This review appears to neglect the folkloric quality, not to mention the tradition of fantasy writing that the novel works out of, the beauty of those plot elements, not unlike, great folk or fairy tales, the Jinni's little figurines or more novelistically, the tenement ceiling he fabricates. It is like saying one wished a suspense or detective novel that had a strong and interesting set of protagonists and interactions between them eschewed necessities of the genre, like coming to grips with the perpetrator of the crime. Or like saying a bit of literary realism is lacking when unexplainable, mysterious, magical elements of real life are left out. To me this is silly. Take the novel on its own terms.